Sometimes getting kids to eat fish can be a real challenge, but it's such a great source of protein that I'm always thinking of fun new ways to present it to little ones who resist it. Cod is an ideal introductory fish because of its mild flavor and light texture. It's also a good source of omega-3's, niacin and vitamins B12 and 6, all of which are important for growing bodies. I find that whenever I serve my kids food they can hold and eat with their hands, they are more prone to eat it. 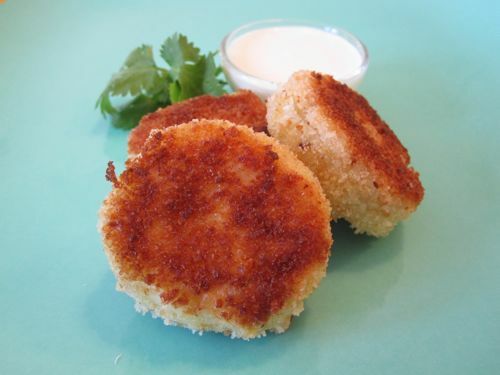 For this recipe, I combined cod with some potato, cheese and breadcrumbs, molded it into bite-sized cakes and then served them up with a zesty dip. I'm never one to "sneak" fish or vegetables into recipes, but if your kids are averse to trying fish, these little cakes are delicious and a great way for them to enjoy something new. You never know, you may make fish fans out of your kids yet! 1. Place all the ingredients in a bowl and whisk to combine. 1. Bring a steamer pot with 2 inches of water to a boil and cook the potato chunks for 15-20 minutes or until fork tender. Remove to a bowl and mash. 2. Add the cod to the steamer pot and cook for 5-6 minutes. Remove to a plate, cool and flake with a fork, being careful to remove any bones. 3. Place the cod, mashed potatoes, parmesan, parsley, 1 egg and salt in a bowl and stir to combine. 4. Shape about 2 tbsp of the cod mixture into 16 evenly shaped patties. 5. Place the breadcrumbs and remaining whisked egg into two separate bowls and gently roll each patty into the whisked egg and then into the bread crumbs. 6. Heat a thin layer of oil in a large saute pan over medium heat. 7. Cook the cod cakes 4 minutes on each side or until golden. 8. Serve with dipping sauce. To Freeze:After step 5, place the patties on a cookie sheet and place in the freezer for one hour, remove and place in ziploc bags, label and freeze up to 4 months. When ready, remove from ziploc bag and place on a plate and place in the fridge to defrost for 24 hours and continue with steps 6-8. You can also just place in the the oven from the freezer at 400 for 10-15 minutes. So... do the mashed potatoes get added in with the cod? (I'm just not seeing where the potatoes go). Yes! Thank you so much for the correction! Any tips on what I can use instead of eggs to bind everything together?? is it possible to bake or toast the cake in a an oven toaster? my 2 1/2 year old loves most food drenched in oil. i'm just trying to remove it out of her system. Yes you can even put it in your oven as well. Put them at 400 for 15 minutes on a sprayed cooking rack. I haven't test this method but it should be fine, let me know the results! Yes before cooking, I will put a tip - thank for the comment!! My 10 month old LOVED these. I only used egg yolk for hers, but they worked pretty well... I was sure she wouldn't eat the whole one (even though it was fairly small) but she could not eat it fast enough. We ate these tonight and yum. We have leftovers. Refrigerate? If so, for how long? Do you not recommend freezing since they are already cooked? Thank you in advance! Refrigerate up to 3 days and you can freeze but I would freeze before cooking. These were great, thanks! I used Haddock because I didn't have Cod and added a bit of fresh, chopped baby spinach and some black pepper to them as well. They were very tasty! I am going to try these with Perch coz i couldnt find Cod yday. Hope it works. We will be trying these tonight. My 5 year old is so picky, I hope he likes them! Can you suggest a good side dish to go with it? Another amazing one! Pre-children, hubby and I used to visit this amazing portuguese resturant, and they had amazing codcakes...well date nites are hard to come by these days with 2 under 4...and both my 16mth and 3.5yo went crazy over these, and so did Hubby and I (good thing I doubled the recipe for future dinners! )&lt;3 Thanks again for all that you do! Made this again today but put them in oven instead since I didn't want to stand over stove....came out just as good...400 degrees for about 10 mins on each side! We loved these! How do you recommend reheating them? Thank you! d8b3d984d8a7d985 d8afd988d8b3d8aad8a7d986 d985d986 d988d982d8aadb8c d985db8c d8aed988d8a7d987d985 d988d8a7d8b1d8af db8cdaa9 d8b3d8b1d988d8b1 d8a8d8b4d985 d8a8d8a7 d8a7d8b1d988d8b1 server conetcnion time out d985d988d8a7d8acd987 d985db8c d8b4d985 d985d986 d8aad985d8a7d985 dlc d987d8a7 d988 daa9d8b1daa9 d8a8d8a7d8b2db8c d8b1d988 d8b7d8a8d982 d8b1d8a7d987d986d985d8a7 daa9d9bedb8c daa9d8b1d8afd985 d988 d8a7d9bed8afdb8cd8aa d987d985 daa9d8b1d8af d988d984db8c d8a8d8a7d8b2 d987d985 d8a8d8a7 d8a7db8cd986 d8a7d8b1d988d8b1 d985d988d8a7d8acd987 d985db8c d8b4d985 d985d986 d8b9daa9d8b3 d8a8d8a7d984d8a7 d8a7d8b2 d9bed988d8b4d987 main d8b1d988 d8a8d8a7 d9bed988d8b4d987 d8aed988d8afd985 d985d982d8a7db8cd8b3d987 daa9d8b1d8afd985 d8afdb8cd8afd985 d8aad8b9d8afd8a7d8af d981d8a7db8cd987d8a7db8c d9bed988d8b4d987 main d985d986 d8aedb8cd984db8c daa9d985 d987d8b3d8aad986 d8afd8b1 d8add8af dbb3dbb4 d8aad8a7 d988d984db8c da86d8b7d988d8b1 d8aad988 d8b9daa9d8b31000 d8a8d8a7d984d8a7 d8a8db8cd8b4 d8a7d8b2 dbb6dbb0 d981d8a7db8cd984 d8a7d8b3d8aa d985d986 daa9d987 dlc d987d8a7 d8b1d988 daa9d9bedb8c daa9d8b1d8afd985 d988d984db8c da86d8b1d8a7 d8aad8b9d8afd8a7d8af d981d8a7db8cd984d987d8a7 daa9d985 d987d8b3d8aad986 d984d8b7d981d8a7 d985d986 d8b1d8a7 d8afd8b1 d8a8d8a7d8b1d987 d8a7db8cd986 d8a7d8b1d988d8b1 d8b1d8a7d987d986d985d8a7db8cdb8c daa9d986db8cd8af.